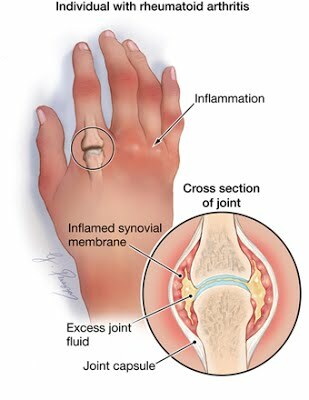 Rheumatoid arthritis (RA) is an in?ammatory disorder of unknown origin that primarily involves the synovial membrane of the joints. Phagocytosis produces enzymes within the joint. The enzymes break down collagen, causing edema, proliferation of the synovial membrane, and ultimately pannus formation. Pannus destroys cartilage and erodes the bone. The consequence is loss of articular surfaces and joint motion. Muscle ?bers undergo degenerative changes. Tendon and ligament elasticity and contractile power are lost. RA affects 1% of the population worldwide, affecting women two to four times more often than men. Clinical features are determined by the stage and severity of the disease. Joint pain, swelling, warmth, erythema, and lack of function are classic symptoms. Palpation of joints reveals spongy or boggy tissue. Fluid can usually be aspirated from the in?amed joint. Begins with small joints in hands, wrists, and feet. Progressively involves knees, shoulders, hips, elbows, ankles, cervical spine, and temporomandibular joints. Symptoms are usually acute in onset, bilateral, and symmetric. Joints may be hot, swollen, and painful; joint stiffness often occurs in the morning. Deformities of the hands and feet can result from misalignment and immobilization. Several factors contribute to an RA diagnosis: rheumatoid nodules, joint in?ammation detected on palpation, laboratory ?ndings, extraarticular changes. Rheumatoid factor is present in about three fourths of patients. RBC count and C4 complement component are decreased; erythrocyte sedimentation rate is elevated. Creactive protein and antinuclear antibody test results may be positive. Arthrocentesis and x-rays may be performed. Treatment begins with education, a balance of rest and exercise, and referral to community agencies for support. Early RA: medication management involves therapeutic doses of salicylates or NSAIDs; includes new COX2 enzyme blockers, antimalarials, gold, penicillamine, or sulfasalazine; methotrexate; biologic response modi?ers and tumor necrosis factoralpha (TNF.) inhibitors are helpful; analgesic agents for periods of extreme pain. Moderate, erosive RA: formal program of occupational and physical therapy; an immunosuppressant such as cyclosporine may be added. Persistent, erosive RA: reconstructive surgery and corticosteroids. Advanced unremitting RA: immunosuppressive agents such as methotrexate, cyclophosphamide, azathioprine, and le?unomide (highly toxic, can cause bone marrow suppression, anemia, GI tract disturbances, and rashes). Also promising for refractory RA is a Food and Drug Administration (FDA)–approved apheresis device: a protein A immunoadsorption column (Prosorba) that binds circulating immune system complex (IgG). RA patients frequently experience anorexia, weight loss, and anemia, requiring careful dietary history to identify usual eating habits and food preferences. Corticosteroids may stimulate appetite and cause weight gain. Lowdose antidepressant medications (amitriptyline) are used to reestablish adequate sleep pattern and manage pain. The most common issues for the patient with RA include pain, sleep disturbance, fatigue, altered mood, and limited mobility. The patient with newly diagnosed RA needs information about the disease to make daily selfmanagement decisions and to cope with having a chronic disease. Provide a variety of comfort measures (eg, application of heat or cold; massage, position changes, rest; foam mattress, supportive pillow, splints; relaxation techniques, diversional activities). It takes time to find the right foam mattress and supportive pillows, but after looking at lots of reviews such as leesa reviews, you will find one perfect for your needs. Administer anti-in?ammatory, analgesic, and slow-acting antirheumatic medications as prescribed. Individualize medication schedule to meet patient’s need for pain management. Encourage verbalization of feelings about pain and chronicity of disease. Teach pathophysiology of pain and rheumatic disease, and assist patient to recognize that pain often leads to unproven treatment methods. Assist in identi?cation of pain that leads to use of unproven methods of treatment. Assess for subjective changes in pain. You can aid in a person’s lack of mobility by investing in your household usually. For example, consider looking into mobility bathing solutions which will help the daily bathing routine and make life easier. Explain how to use energy conservation techniques (pacing, delegating, setting priorities). Identify physical and emotional factors that can cause fatigue. Facilitate development of appropriate activity/rest schedule. Encourage adherence to the treatment program. Refer to and encourage a conditioning program. Encourage adequate nutrition, including source of iron from food and supplements. Encourage verbalization regarding limitations in mobility. Assess need for occupational or physical therapy consultation: Emphasize range of motion of affected joints; promote use of assistive ambulatory devices; explain use of safe footwear; use individual appropriate positioning/posture. Assist to identify environmental barriers. Encourage independence in mobility and assist as needed: Allow ample time for activity; provide rest period after activity; reinforce principles of joint protection and work simpli?cation. Initiate referral to community health agency. interfere with ability to perform self-care activities. Develop a plan based on the patient’s perceptions and priorities on how to establish and achieve goals to meet selfcare needs, incorporating joint protection, energy conservation, and work simpli?cation concepts: Provide appropriate assistive devices; reinforce correct and safe use of assistive devices; allow patient to control timing of self-care activities; explore with the patient different ways to perform dif?cult tasks or ways to enlist the help of someone else. Consult with community health care agencies when individuals have attained a maximum level of selfcare yet still have some de?cits, especially regarding safety. Help patient identify elements of control over disease symptoms and treatment. Encourage patient’s verbalization of feelings, perceptions, and fears. Identify areas of life affected by disease. Answer questions and dispel possible myths. Develop plan for managing symptoms and enlisting support of family and friends to promote daily function. Help patient recognize and deal with side effects from medications. Monitor for medication side effects, including GI tract bleeding or irritation, bone marrow suppression, kidney or liver toxicity, increased incidence of infection, mouth sores, rashes, and changes in vision. Other signs and symptoms include bruising, breathing problems, dizziness, jaundice, dark urine, black or bloody stools, diarrhea, nausea and vomiting, and headaches. Monitor closely for systemic and local infections, which often can be masked by high doses of corticosteroids. Focus patient teaching on the disease, possible changes related to it, the prescribed therapeutic regimen, side effects of medications, strategies to maintain independence and function, and safety in the home. Encourage patient and family to verbalize their concerns and ask questions. Address pain, fatigue, and depression before initiating a teaching program, because they can interfere with patient’s ability to learn. Instruct patient about basic disease management and necessary adaptations in lifestyle. Refer for home care as warranted (eg, frail patient with signi?cantly limited function). Assess the home environment and its adequacy for patient safety and management of the disorder. Identify any barriers to compliance, and make appropriate referrals. For patients at risk for impaired skin integrity, monitor skin status and also instruct, provide, or supervise the patient and family in preventive skin care measures. Assess patient’s need for assistance in the home, and supervise home health aides. Make referrals to physical and occupational therapists as problems are identi?ed and limitations increase. Alert patient and family to support services such as Meals on Wheels and local Arthritis Foundation chapters. Assess the patient’s physical and psychological status, adequacy of symptom management, and adherence to the management plan. Emphasize the importance of followup appointments to thepatient and family. Appear relaxed, able to sleep/rest and participate in activities appropriately. Incorporate relaxation skills and diversional activities into pain control program. Consider reports of pain, noting location and intensity (scale of 0–10). Note precipitating factors and nonverbal pain cues. Rationale: Favorable in determining pain management needs and effectiveness of program. Recommend or provide firm mattress or bedboard, small pillow. Elevate linens with bed cradle as needed. Rationale: Soft and sagging mattress, large pillows prevent maintenance of proper body alignment, placing stress on affected joints. Elevation of bed linens reduces pressure on inflamed or painful joints. Suggest patient assume position of comfort while in bed or sitting in chair. Promote bedrest as indicated. Rationale: In severe disease or acute exacerbation, total bedrest may be necessary (until objective and subjective improvements are noted) to limit pain or injury to joint. Place and monitor use of pillows, sandbags, trochanter rolls, splints, braces. Rationale: Rests painful joints and maintains neutral position. Note: Use of splints can decrease pain and may reduce damage to joint; however, prolonged inactivity can result in loss of joint mobility and function. Encourage frequent changes of position. Assist patient to move in bed, supporting affected joints above and below, avoiding jerky movements. Rationale: Prevents general fatigue and joint stiffness. Stabilizes joint, decreasing joint movement and associated pain. Monitor the duration, not the intensity, of morning stiffness. Rationale: Duration more accurately reflects the disease’s severity. Recommend that patient take warm bath or shower upon arising or at bedtime. Apply warm, moist compresses to affected joints several times a day. Monitor water temperature of compress, baths, and so on. Rationale: Heat promotes muscle relaxation and mobility, decreases pain, and relieves morning stiffness. Sensitivity to heat may be diminished and dermal injury may occur. Rationale: Promotes relaxation and reduces muscle tension. Encourage use of stress management techniques such as progressive relaxation, biofeedback, visualization, guided imagery, self-hypnosis, and controlled breathing. Provide Therapeutic Touch. Rationale: Promotes relaxation, provides sense of control, and may enhance coping abilities. Involve in diversional activities appropriate for individual situation. Rationale: Refocuses attention, provides stimulation, and enhances self-esteem and feelings of general well-being. Medicate before planned activities and exercises as indicated. Rationale: Promotes relaxation, reduces muscle tension and spasms, facilitating participation in therapy. Rationale: ASA exerts an anti-inflammatory and mild analgesic effect, decreasing stiffness and increasing mobility. ASA must be taken regularly to sustain a therapeutic blood level. Research indicates that ASA has the lowest toxicity index of commonly prescribed NSAIDs. Rationale: These drugs control mild to moderate pain and inflammation by inhibition of prostaglandin synthesis. Rationale: These drugs modify the immune response and suppress inflammation. Rationale: These drugs vary in action, but all reduce pain and swelling, lessening arthritic symptoms rather than eliminating them. Arava (FDA approved in 1998) is the first oral drug shown to slow progression of RA and damage to joints. Rationale: A new class of medication, COX-2 inhibitors interfere with prostaglandin production, similarly to NSAIDs, but are less likely to harm the stomach lining or kidneys. May be used in combination with other medications. Rationale: These injectable drugs are the first genetically engineered medications for arthritis. These anti-TNF compounds block inflammation and rapidly decrease pain and joint swelling. Enbrel is self-injected twice a week and may be used in combination with methotrexate. Remicade is administered IV at 1- to 3-month intervals. Note: Because of concerns about immune function suppression, Enbrel is recommended only for patients who are unable to tolerate methotrexate or failed to respond to at least two other DMARDs. Rationale: Characteristics of anti-inflammatory and immune modifier effects coupled with ability to block metalloproteinases (associated with joint destruction) have resulted in dramatic benefits in research studies. Rationale: May control systemic effects of RA synovitis and scleroderma if other therapies have not been successful. High rate of side effects (thrombocytopenia, leukopenia, aplastic anemia) necessitates close monitoring. Note: Drug should be given between meals because drug absorption is impaired by food, as well as antacids and iron products. Rationale: Given with NSAID agents to minimize gastric irritation and discomfort, reducing risk of GI bleed. Rationale: Although narcotics are generally contraindicated because of chronic nature of condition, short-term use of these products may be required during periods of acute exacerbation to control severe pain. Assist with physical therapies such as paraffin glove, whirlpool baths. Rationale: Provides sustained heat to reduce pain and improve ROM of affected joints. Apply ice or cold packs when indicated. Rationale: Cold may relieve pain and swelling during acute episodes. Instruct in use and monitor effect of transcutaneous electrical nerve stimulator (TENS) unit if used. Rationale: Constant low-level electrical stimulus blocks transmission of pain sensations. Maintain position of function with absence/limitation of contractures. Demonstrate techniques/behaviors that enable resumption/continuation of activities. Assess and continuously monitor degree of joint inflammation and pain. Rationale: Level of activity and exercise depends on progression and resolution of inflammatory process. Maintain bedrest or chair rest when indicated. Schedule activities providing frequent rest periods and uninterrupted nighttime sleep. Rationale: Systemic rest is mandatory during acute exacerbations and important throughout all phases of disease to reduce fatigue, improve strength. Assist with active and passive ROM and resistive exercises and isometrics when able. Rationale: Maintains and improves joint function, muscle strength, and general stamina. Note: Inadequate exercise leads to joint stiffening, whereas excessive activity can damage joints. Encourage patient to maintain upright and erect posture when sitting, standing, walking. Rationale: Maximizes joint function, maintains mobility. Urge the patient to perform activities of daily living (ADLs), such as practicing good hygiene, dressing and feeding himself. Rationale: ADLs that can be done should be encouraged to maximize function. Discuss and provide safety needs such as raised chairs and toilet seat, use of handrails in tub, shower and toilet, proper use of mobility aids and wheelchair safety. Rationale: Helps prevent accidental injuries and falls. Reposition frequently using adequate personnel. Demonstrate and assist with transfer techniques and use of mobility aids such as walker, cane, trapeze. Rationale: Relieves pressure on tissues and promotes circulation. Facilitates self-care and patient’s independence. Proper transfer techniques prevent shearing abrasions of skin. Position with pillows, sandbags, trochanter roll. Provide joint support with splints, braces. Rationale: Promotes joint stability (reducing risk of injury) and maintains proper joint position and body alignment, minimizing contractures. Suggest using small or thin pillow under neck. Rationale: Prevents flexion of neck. Provide foam or alternating pressure mattress. Rationale: Decreases pressure on fragile tissues to reduce risks of immobility and development of decubitus. Verbalize increased confidence in ability to deal with illness, changes in lifestyle, and possible limitations. Formulate realistic goals/plans for future. Encourage verbalization about concerns of disease process, future expectations. Rationale: Provides opportunity to identify fears and misconceptions and deal with them directly. Encouraged a balanced diet, but make sure the patient understands that special diets won’t cure RA. Stress the need for weight control. Rationale: Obesity adds further stress to joints. Ascertain how patient views self in usual lifestyle functioning, including sexual aspects. Rationale: Identifying how illness affects perception of self and interactions with others will determine need for further intervention and counseling. Discuss patient’s perception of how SO perceives limitations. Rationale: Verbal and nonverbal cues from SO may have a major impact on how patient views self. Acknowledge and accept feelings of grief, hostility, dependency. Rationale: Constant pain is wearing, and feelings of anger and hostility are common. Acceptance provides feedback that feelings are normal. Note withdrawn behavior, use of denial, or over concern with body changes. Rationale: May suggest emotional exhaustion or maladaptive coping methods, requiring more in-depth intervention or psychological support. Set limits on maladaptive behavior. Assist patient to identify positive behaviors that will aid in coping. Rationale: Helps patient maintain self-control, which enhances self-esteem. Involve patient in planning care and scheduling activities. Rationale: Enhances feelings of competency and self-worth, encourages independence and participation in therapy. Assist with grooming needs as necessary. Rationale: Maintaining appearance enhances self-image. Give positive reinforcement for accomplishments. Rationale: Allows patient to feel good about self. Reinforces positive behavior. Enhances self-confidence. Refer to psychiatric counseling like psychiatric clinical nurse specialist, psychiatrist or psychologist, social worker. Rationale: Patient and SO may require ongoing support to deal with long-term and debilitating process. Administer medications as indicated (antianxiety and mood-elevating drugs). Rationale: May be needed in presence of severe depression until patient develops more effective coping skills. Perform self-care activities at a level consistent with individual capabilities. Demonstrate techniques/lifestyle changes to meet self-care needs. Identify personal/community resources that can provide needed assistance. Ascertain usual level of functioning (0–4) before onset or exacerbation of illness and potential changes now anticipated. Rationale: May be able to continue usual activities with necessary adaptations to current limitations. Maintain mobility, pain control, and exercise program. Rationale: Support physical and emotional independence. Assess barriers to participation in self-care. Identify and plan for environmental modifications. Rationale: Prepares for increased independence, which enhances self-esteem. Allow patient sufficient time to complete tasks to fullest extent of ability. Capitalize on individual strengths. Rationale: May need more time to complete tasks by self but provides an opportunity for greater sense of self-confidence and self-worth. Consult with rehabilitation specialists (occupational therapist). Rationale: Helpful in determining assistive devices to meet individual needs (buttonhook, long-handled shoehorn, reacher, hand-held shower head). Arrange home-health evaluation before discharge, with follow-up afterward. Rationale: Identifies problems that may be encountered because of current level of disability. Provides for more successful team efforts with others who are involved in care (occupational therapy team). Arrange for consult with other agencies (Meals on Wheels, home care service, nutritionist). Rationale: May need additional kinds of assistance to continue in home setting. Demonstrate appropriate, effective use of resources. Determine level of physical functioning using Functional Level Classification 0–4. Rationale: Identifies degree of assistance and support required. For example, the level 0 patient is completely able to perform usual activities of daily living (self-care, vocational, and avocational), whereas the level 4 patient is limited in all these areas and does not participate in activity. Evaluate environment to assess ability to care for self. Rationale: Determines feasibility of remaining or changing home layout to meet individual needs. Determine financial resources to meet needs of individual situation. Identify support systems available to patient, (extended family, friends and neighbors). Rationale: Availability of personal resources and community supports will affect ability to problem-solve and choice of solutions. Develop plan for maintaining a clean, healthful environment such as sharing of household repair and tasks between family members or by contract services. Rationale: Ensures that needs will be met on an ongoing basis. Identify sources for necessary equipment (lifts, elevated toilet seat, wheelchair). Rationale: Provides opportunity to acquire equipment before discharge. Coordinate home evaluation by occupational therapist and rehabilitation team. Rationale: Useful for identifying adaptive equipment, ways to modify tasks to maintain independence. Identify and meet with community resources (visiting nurse, homemaker service, social services, senior citizens’ groups). Rationale: Can facilitate transfer or support continuation in home setting. Verbalize understanding of condition/prognosis, and potential complications. Develop a plan for self-care, including lifestyle modifications consistent with mobility and/or activity restrictions. Review disease process, prognosis, and future expectations. Discuss patient’s role in management of disease process through nutrition, medication, and balanced program of exercise and rest. Rationale: Goal of disease control is to suppress inflammation in joints and other tissues to maintain joint function and prevent deformities. Assist in planning a realistic and integrated schedule of activity, rest, personal care, drug administration, physical therapy, and stress management. Rationale: Provides structure and defuses anxiety when managing a complex chronic disease process. Rationale: Can increase patient’s energy level and mental alertness, minimize functional limitations. Program needs to be customized based on joints involved and patient’s general condition to maximize effect and reduce risk of injury. Stress importance of continued pharmaco therapeutic management. Rationale: Benefits of drug therapy depend on correct dosage (aspirin must be taken regularly to sustain therapeutic blood levels of 18–25 mg per dL). Recommend use of enteric-coated or buffered aspirin or nonacetylated salicylates such as choline salicylate (Arthropan) or choline magnesium trisalicylate (Trilisate). Rationale: Coated or buffered preparations ingested with food minimize gastric irritation, reducing risk of bleeding and hemorrhage. Note: Non acetylated products have a longer half-life, requiring less frequent administration in addition to producing less gastric irritation. Suggest taking medications, such as NSAIDs, with meals, milk products, or antacids and at bedtime. Rationale: Limits gastric irritation. Reduction of pain at hs enhances sleep, and increased blood level decreases early-morning stiffness. Identify adverse drug effects (tinnitus, gastric intolerance, GI bleeding, purpuric rash). Rationale: Prolonged, maximal doses of aspirin may result in overdose. Tinnitus usually indicates high therapeutic blood levels. If tinnitus occurs, the dosage is usually decreased by 1 tablet every 2–3 days until it stops. Stress importance of reading product labels and refraining from OTC drug usage without prior medical approval. Rationale: Many products (cold remedies, antidiarrheals) contain hidden salicylates that increase risk of drug overdose and harmful side effects. Review importance of balanced diet with foods high in vitamins, protein, and iron. Rationale: Promotes general well-being and tissue repair and regeneration. Encourage obese patient to lose weight, and supply with weight reduction information as appropriate. Rationale: Weight loss reduces stress on joints, especially hips, knees, ankles, feet. Provide information and resources for assistive devices (wheeled dolly or wagon for moving items, pickup sticks, lightweight dishes and pans, raised toilet seat, safety handlebars). Rationale: Reduces force exerted on joints and enables individual to participate more comfortably in needed and desired activities. Discuss energy-saving techniques (sitting instead of standing to prepare meals or shower). Rationale: Prevents fatigue; facilitates self-care and independence. Encourage maintenance of correct body position and posture both at rest and during activity like keeping joints extended, not flexed, wearing splints for prescribed periods, avoiding remaining in a single position for extended periods, positioning hands near center of body during use, and sliding rather than lifting objects when possible. Rationale: Good body mechanics must become a part of patient’s lifestyle to lessen joint stress and pain. Review necessity of frequent inspection of skin and meticulous skin care under splints, casts, supporting devices. Demonstrate proper padding. Rationale: Reduces risk of skin irritation and breakdown. Discuss necessity of medical follow-up and laboratory studies, (ESR, salicylate levels, PT). Rationale: Drug therapy requires frequent assessment and refinement to ensure optimal effect and to prevent overdose or dangerous side effects (aspirin prolongs PT, increasing risk of bleeding). Provide for sexual and childbirth counseling as necessary. Rationale: Information about different positions and techniques or other options for sexual fulfillment may enhance personal relationships and feelings of self-worth and self-esteem. Note: A large number of patients with RA are in childbearing years and need counseling, support, and medical interventions. Identify community resources (Arthritis Foundation). Rationale: Assistance and support from others promotes maximal recovery.